… is working overtime and I feel a little like the image I am posting today – over-run with tasks to do. I am preparing for the Gathering of the Guilds at the Moose Jaw Prairie Hearts Quilters Guild. I am invited to present a talk tomorrow night and with that I am feeling the pressure to bring some new work along. I have had a UFO (Un-Finished Object) in my studio storage. I don’t usually have UFOs around, this being a rare exception. Just Monday I woke up and had an idea for the piece and I carved out some time to audition a couple of options. Suddenly it stuck me: The piece is a Modern Quilt and off I was to the races to finish it. Nothing like a deadline! It is coming together nicely and I plan to add the facing and hanging sleeve tonight. Back to the image I posted: I put up my hand a little too fast when it came to a Regina Photo Club Member Challenge. The plan sounded simple: We were to submit two images each. There were four participants in my group and we each were to process four of the images submitted (1 per participant). The second image each person submitted was to be considered for a composite (or so I thought – we were allowed to use all eight…). 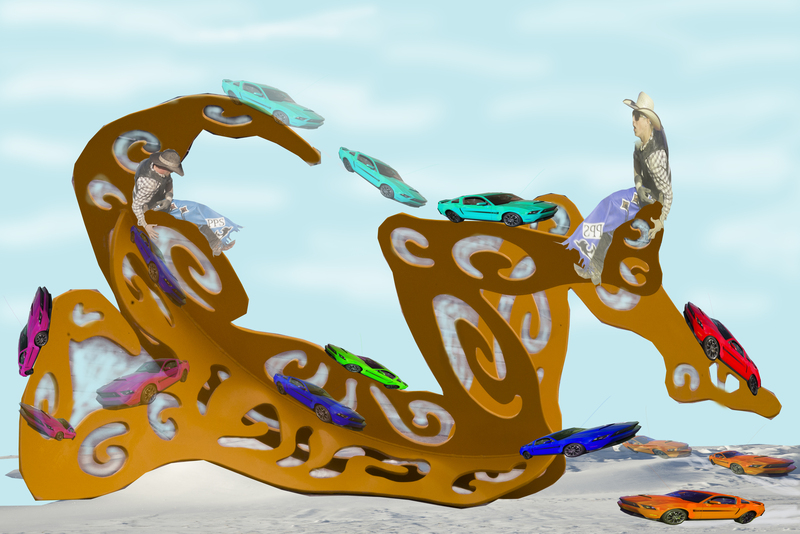 I opted to use only the four “special” images and came up with the “Hot Wheels” sculpture composite. 02 Apr	This entry was published on April 2, 2014 at 5:50 pm. It’s filed under Art, Creativity Update, Design, Journaling, Studio / Workshop / Creative Space Challenge and tagged Gathering of the Guilds in Moose Jaw 2014, getting ready for my presentation, photo composite challenge. Bookmark the permalink. Follow any comments here with the RSS feed for this post.